Also serving communities of Rock Spring, Calhoun, Fort Oglethorpe, Rossville, Flintstone. The average cost of assisted living in Dalton is $2,400 per month. This is lower than the national median of $3,346. To help you with your search, browse the 36 reviews below for assisted living facilities in Dalton. On average, consumers rate assisted living in Dalton 4.5 out of 5 stars. Better rated regions include East Ridge with an average rating of 4.6 out of 5 stars. Caring.com has helped thousands of families find high-quality senior care. To speak with one of our Family Advisors about assisted living options and costs in Dalton, call (855) 863-8283. Assisted living facilities in Dalton and central Georgia are regulated by the Georgia Department of Community Health. Such facilities are defined by the state as having 25 or more residents. Assisted living facilities in Georgia provide help with daily tasks, such as dressing and eating, as well as offer specialized care for residents with developmental disabilities, dementia and other chronic mental and physical health conditions. The average cost of assisted living in Dalton is $3,111 per month, considerably less than the national average of $3,750. Located in the foothills of the Blue Ridge Mountains, Dalton has hot, humid summers and mild, cool winters. The average high temperature in January is 49 degrees Fahrenheit and the average high temperature in July is 89 degrees. The air quality in the greater Dalton area receives a "B" rating from the National Lung Association for particle pollution and a "C" rating for ozone levels. Living in Dalton is much more affordable than other parts of the United States. The cost of living is 17 percent lower here than the national average. Crime, particularly theft and property crime, is a problem in Dalton. The city has a higher crime rate than 72 percent of other cities in Georgia. Dalton is home to the Creative Arts Guild, one of the oldest community arts centers in Georgia. In addition, the city is home to the Dalton Little Theatre, the Civic Theatre Group and a weekly farmers' market. In the summer, the city hosts weekly free concerts in downtown. Assisted Living costs in Dalton start around $2,400 per month on average, while the nationwide average cost of assisted living is $4,000 per month, according to the latest figures from Genworth’s Cost of Care Survey. It’s important to note that assisted living rates in Dalton and the surrounding suburbs can vary widely based on factors such as location, the level of care needed, apartment size and the types of amenities offered at each community. 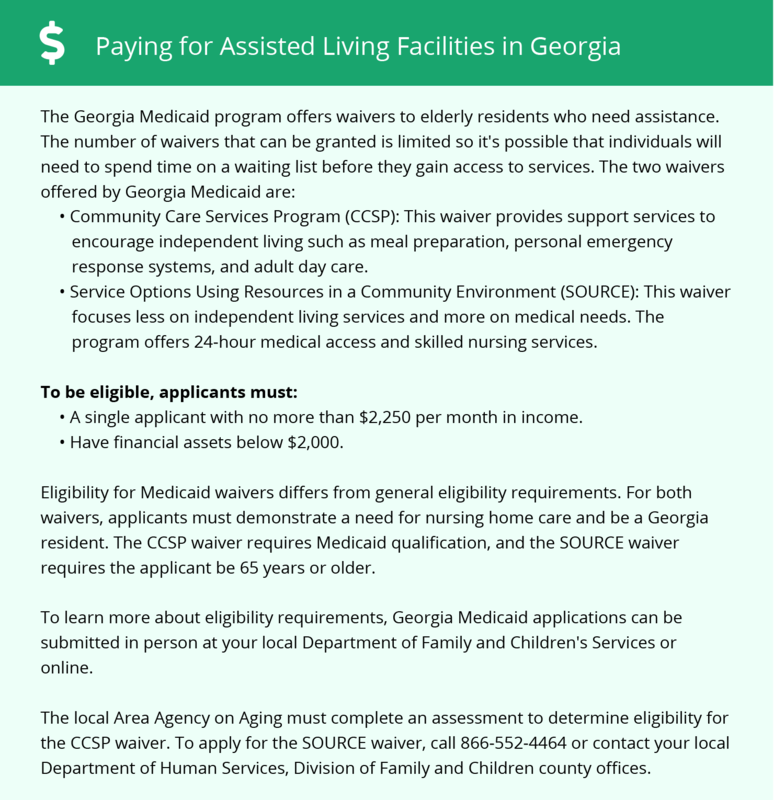 Eligible seniors in the Dalton, Georgia, area can apply for funding to help pay for assisted living. For those who need only a little bit of extra help, they can apply to the Community Care Service Program (CCSP), whereas those who need a little more help should apply for the Service Options Using Resources in a Community Environment (SOURCE) program. Dalton and the surrounding area are home to numerous government agencies and non-profit organizations offering help for seniors searching for or currently residing in an assisted living community. These organizations can also provide assistance in a number of other eldercare services such as geriatric care management, elder law advice, estate planning, finding home care and health and wellness programs. To see a list of free assisted living resources in Dalton, please visit our Assisted Living in Georgia page. Dalton-area assisted living communities must adhere to the comprehensive set of state laws and regulations that all assisted living communities in Georgia are required to follow. Visit our Assisted Living in Georgia page for more information about these laws.